Black Student Fellowship opened its doors on Tuesday, April 9, in its first meeting as an officially recognized student club. The meeting took place in Perks Lounge. The friendly environment introduced people of all cultures and backgrounds to a place where they could come and feel welcomed in a community where the integration of African-American culture could be shared. 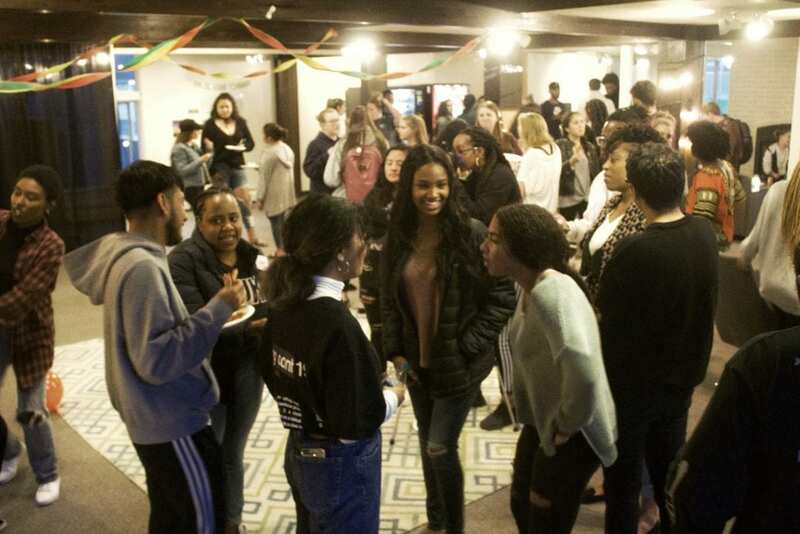 With the kickoff event, Black Student Fellowship (BSF) wanted to make their establishment known to the community, and that they are ready to start building a community in which people feel welcomed. The new club provided beverages and Costco pizza as refreshments for the night. The first portion of the meeting was designed to allow new members to meet each other and mingle. Event attendance records showed a gathering of over 100 students, of diverse ethnicities and backgrounds. This allowed many students to engage in conversations that they may have otherwise never gotten a chance to have with their peers. Along with the refreshments and the clamor of students speaking was the faint sound of music, which later in the night served as the background for the teaching of an African line dance routine. The meeting was led by the president and co-founder Aimee Ingabire. She discussed the mission statement of the club in general, as well as the reason for starting BSF. “We want to spread awareness of African-American culture at Northwest University,” Ingabire said. BSF wants to integrate the culture of NU for students of color while allowing students of all experiences and backgrounds to engage with one another. According to the founders of BSF, the club isn’t for a certain group of people; it is a more of a concept that pushes for collaboration between all ethnicities, cultures, and experiences. They have the stated goal of providing a community what they didn’t have the luxury of experiencing when they came to Northwest University. They want to make sure that African-Americans and any other students of color will instantly know they have a place in the NU community. The founders said many students of color at NU find it hard to adjust to the unique culture of the school — that it is more often than not a culture shock, and when they have no outlet, it can be very difficult to get used to. BSF is new to NU, but the idea of creating a club, like this one has been around for quite some time. Assistant Professor Dr. Rowlanda Cawthon has been a vocal supporter of the group throughout the process. “[BSF is] a place of hope, acceptance, and worshiping God,” Cawthon said. For the leaders of Black Student Fellowship, the April meeting is only the beginning. They said that, through prayer and action, they are determined to use BSF as a tool to change the divided culture they see at NU. This club is long overdue. Good job, Aimee! Thank you Dr. Delamarter! The leaders of BSF worked very well to put this together. Thanks again for your support.